TIP #1: Bring colored copies of your resume. While you did submit your resume before the interview, it never hurts to be prepared. Only a few of the interviewers may have a copy of your resume, so bringing extra is a great way to make sure that they each read your resume for themselves. Plus, it never hurts for them to know you think ahead and come prepared. TIP #2: Have a firm handshake and good posture. Body language is key. Watch the twitching, talking fast, crossed arms, and slouching. It is important that your body communicates the same strength and confidence as your verbal communication. In addition, a firm handshake means that you can stand your ground and are competent, confident, and professional. TIP #3: Ditch the gum. Yes, having fresh breath is important, but so is talking clearly and slowly. Instead of chewing gum and risking it falling out of your mouth or getting caught in your hair, have a mint before you head in. Some people also think that chewing gum is loud and obnoxious, so the more professional you are, the better! TIP #4: Ask them questions. Interviewers want to see that you have an interest in their company, mission, products, and people. Having questions for them throughout and at the end of the interview proves to them that you genuinely care. Asking questions also shows that you are curious, value learning from others, and have been thinking about the company even when the interview is focused on you. TIP #5: Do research about the company. When it comes to a potential job/career, the more you know the better. Research the company's history, their mission, and products on social media and their website. Knowing your interviewer and the company means that you are more knowledgeable and can better understand what you are interviewing for. It also shows that you did your homework and care about the life of the company! TIP #6: Pick your outfit out the night before. Not only does this save you time in the morning, but you can also try on different options, and iron them if needed. Keep accessories, makeup, and perfume to a minimum. When in doubt, got with neutral — no bright nail polish or overwhelming tops/pants. Whether you wear a blazer and slacks or a dress and flats, make sure that you feel comfortable, confident and dress for success! TIP #7: Rehearse potential questions beforehand. There is nothing worse than being stuck on a simple question and not knowing where to start. There are tons of sample interview questions online that can help prepare you for potential questions. Think through your responses and even have a mock interview with a friend or family member. Don't focus on memorizing your answer, just have some talking points ready. The most important advice is to be genuine and be real! TIP #8: Eye contact is key. Wherever you are in your day to day life, eye contact is so important! Interviewers like to see if you can maintain eye contact and are respectful and attentive. Eye contact also indicates that you are listening. Being nervous is normal, but address your nervous ticks beforehand so you can focus on the questions being asked. TIP #9: Arrive at least 10 minutes early. TIP #10: Get a good night sleep and have a hearty breakfast! On the day of your interview, you want to have a strong mind and a healthy heart. Strive to get at least eight hours of sleep the night before and give yourself a little more time in the morning to make yourself a good breakfast to avoid the awkward stomach growls during your interview. 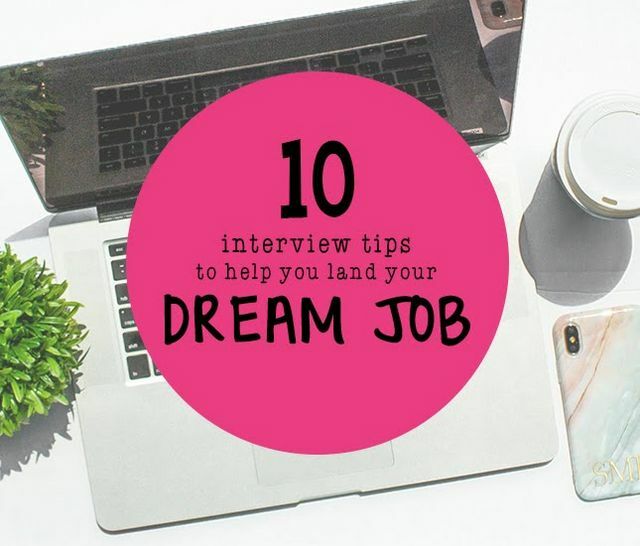 Whatever the job that you are interviewing for may be, all ten of these tips will help put you at the top of your interview game. If you've landed the interview, push those nerves aside because this interview is all yours! What interview tips are your favorite?! Let us know in the comments!